Potato towers are a form of extreme hilling that uses a structure to add a foot or more of soil above the seed tuber. Towers are not a new idea, but they have only become popular in recent years. Potatoes are normally hilled up about six inches, whether they are grown in the ground or in containers. Hilling up much beyond six inches brings no benefits and is likely to reduce yield. The purpose of hilling is not to stimulate production of tubers, but to protect the tubers from the environment. Potato yield is primarily limited by foliage area, not by the amount of soil above the seed tuber. Conventional container growing works fine with potatoes but potato towers don’t work. You have probably read about potato towers somewhere on the Internet. The idea is immediately appealing: rather than strain your back growing potatoes in the ground, you can grow just one plant, but keep adding soil to it in layers to increase the yield. This is essentially extreme hilling, adding 12 to 30 inches or more of soil over the top of the seed piece instead of the more typical 4 to 6 inches. Each additional layer delivers essentially a doubling of the yield versus growing the plant in the ground. At the end of the season, you just take the tower apart and hundreds of pounds of perfect spuds tumble out at your feet. The only problem with this idea is that it isn’t true. You will find no research that supports this idea. You will also not find any photographic evidence that is not obviously faked. The claims about the physiological basis for this idea are totally wrong. Despite these limitations, the myth persists and grows stronger each year. A friend called the potato tower phenomenon “the single worst piece of gardening advice that you see frequently on the Internet,” and although the Internet is chock full of terrible gardening advice, I think he is probably right because towers require a substantial investment of time and material that brings no benefits. This post will take a look at the history of this idea and delve into the reasons why it simply doesn’t work. Before we go any further, I want to clarify exactly what I mean by “doesn’t work.” I always get some angry responses when I claim that towers don’t work. I am not saying that you can’t grow potatoes in a tower or even that you can’t get good yields in a tower. I am saying that you won’t get better results with a tower than you can obtain under similar growing conditions without the additional levels of hilling. You will almost certainly get worse results with a tower if you do perform all that additional hilling. (Growing conditions vary, and in some climates it might still work out for you, but it will be success in spite of your efforts.) It is specifically the claim that towers are able to produce greater yields due to the production of more layers of tubers that is wrong. If you take that away, then a tower is just a planter and subject to all the pluses and minuses of growing potatoes in containers, which are specific to climate. Several people have asked, quite reasonably, how we could tell if a potato tower worked as described. I don’t want to get your hopes up, because there is really no possibility that you are going to find success with this, but it is still a useful exercise to imagine what it would look like. Per plant yields with elite potato varieties occasionally reach 10 pounds or more under perfect conditions. If a tower worked as described, it would be able to routinely exceed that threshold. The tower hypothesis claims that the additional hilling allows the plant to create more tubers, so the tuber count should also be significantly higher than for a conventionally grown plant. If you can show this kind of high yield, high tuber count combination and you can reproduce it reliably, you might have the first real tower potato. Do not invest your retirement savings in this project though. As far as I can tell, the potato tower began with the idea of growing potatoes in tires. Somebody realized that you could achieve the necessary hilling quite easily by putting a potato on the ground and then filling up the tire with soil. That works very nicely. I’m sure it didn’t take long before someone decided to add a second tire, then a third, and the tower was born. I’m not sure how far back that idea goes, but I’m guessing that just about as long as there have been tires, there have been people trying to grow stuff in them. I can find references to growing potatoes in tires going back to the 1970s. References to towers don’t go that far back, but some structures that we would now call potato towers do. The most notable of these is a potato tower patent from 1976, from which I lifted the image above. 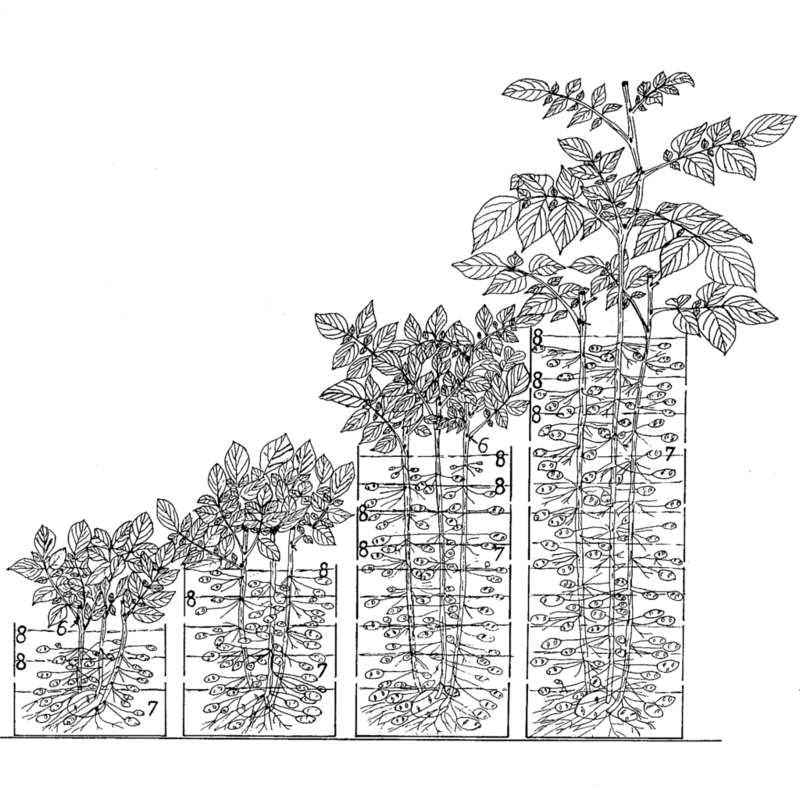 While the patent predates the term “potato tower,” all the elements are there and the illustration does an admirable job showing a kind of potato growth that has never been captured on photo or video. One of the most fascinating parts of the potato tower phenomenon is how little people are deterred by its lack of reality. There is more than one patent for potato towers and hundreds of articles, both in print and on-line. A lot of work went into writing all that material, but apparently no testing. That’s pretty remarkable. 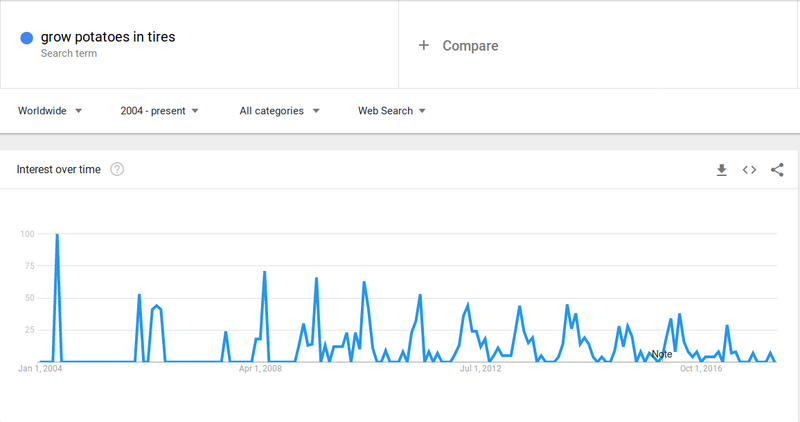 So, fewer people are searching for information about growing potatoes in tires, but more people are looking for information about potato towers. 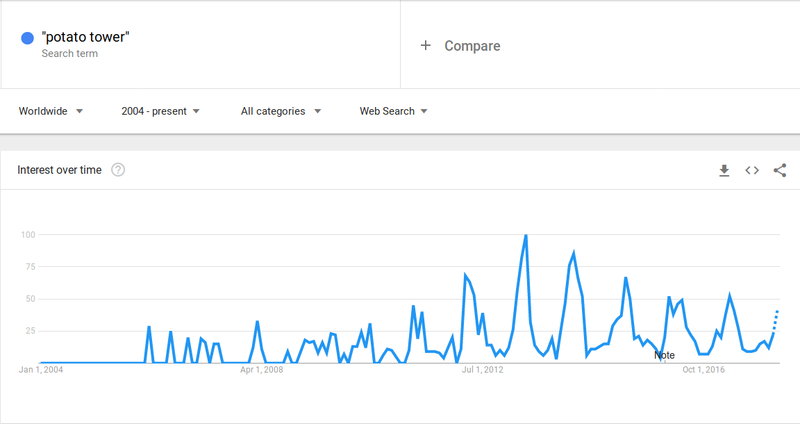 While spring searches for the term peaked in 2013, the overall amount of searches year-round have been pretty constant. It doesn’t look like the potato tower myth is ready to die out on its own, unfortunately. For the first few years, the idea shows up primarily in forums and personal blogs, but starting about 2005, it began to creep into magazines and newspapers as well. 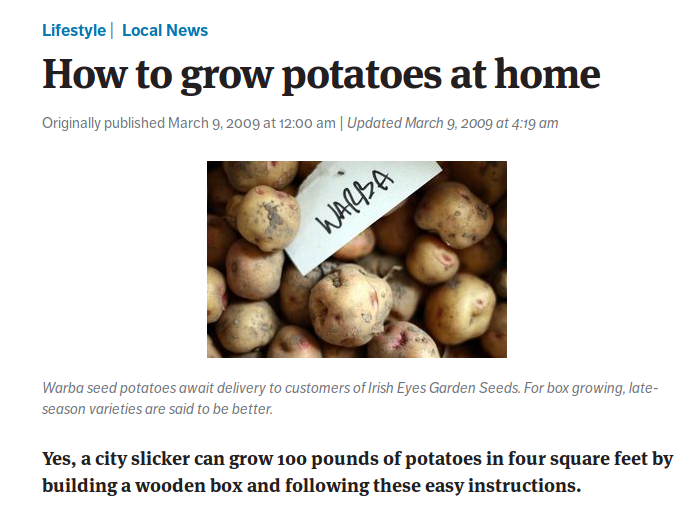 One frequently cited article from the Seattle Times in 2005 (followed by a more popular recycled version in 2009) promises 100 pounds of potatoes in four square feet. This idea traces back to Irish Eyes, a seed potato supplier, and appeared in newspapers across the country over several years. In fairness, the article reports that someone who tried it produced only 25 pounds. Assuming that they planted one tuber per square foot, that would be a yield of 6.25 pounds. That’s on the high side vs. the typical field yield, but still well within the possibilities for growing potatoes in the ground. This is one of the common results that you see with towers: people are very impressed with the yield, even though it is not any better than they could have expected if they grew plants in the ground with the same level of attention. Other than being taller than necessary, the Irish Eyes box (see right) is a reasonable enough design and the yield promises are not impossible, although few people are likely to achieve them. By allowing the plants to grow out over the sides of a 4 square foot box, you can really expand the foliage area to around 16 square feet. (But bear in mind that you could easily grow 16 to 20 plants in 16 square feet of ground.) If you live in a perfect climate and put the plants on drip irrigation, you could possibly grow 13 plants in that box – 9 along the perimeter and dangling out and four growing in the center. 100 pounds divided by thirteen plants gives 7.7 pounds per plant. That is a great yield but, again, one that can certainly be achieved growing in the ground, everything else being equal. A Denver Post article supplies a bit more information, including the fact that the originator of this idea has achieved a maximum yield of 81 pounds. That would be 6.2 pounds per plant, still a great yield, but well within reason. The interesting thing about this design is that it is much more elaborate than it needs to be. There is no reason to build it up so high. The multiple levels would lead you to believe that what happens inside the box will look a lot like the patent illustration at the beginning, with tubers forming at every level of the box. That just doesn’t happen. If you grow a potato like this, when you dig it up, you are going to find a very long stem and a cluster of tubers at about the level that you planted the seed piece. 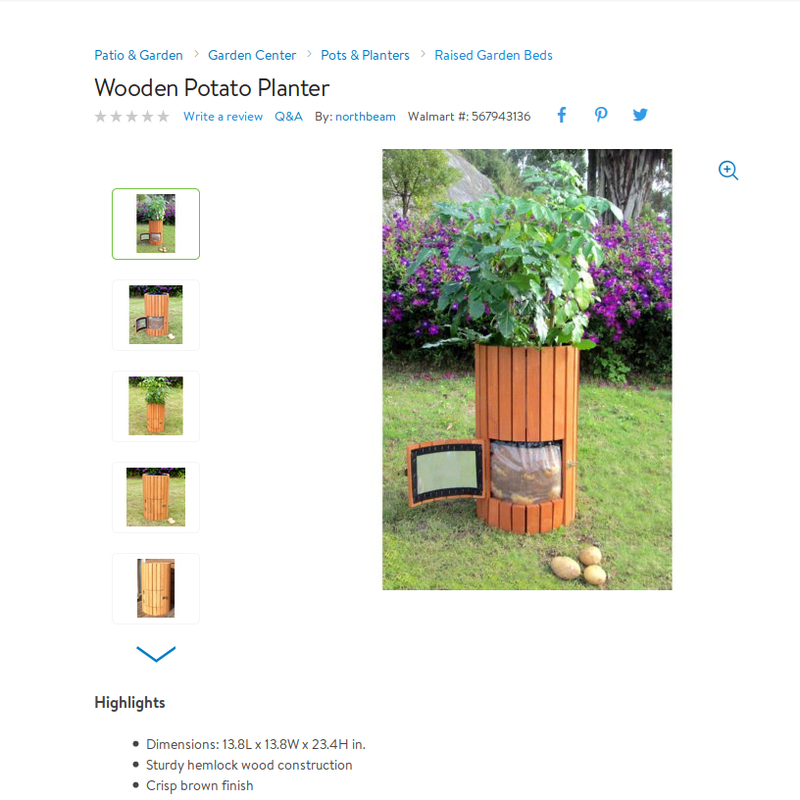 This is really just an unusually tall planter. You could do as well with a container of the same area that is only about a foot tall. I think that we have found the origin of the modern potato tower concept, but it had not yet reached the point of unbelievability So, when did this thing go fully fraudulent? It is actually pretty hard to pin it down. Starting in 2009, there were hundreds of blogs and articles per year about potato towers, offering a spectrum of variations on the story. I read dozens of these articles and I would have to do a lot more work to establish the timeline. It isn’t worth the effort. One thing that I feel pretty confident about though is that most people did not set out to tell a tall tale (so to speak). This story evolved over time, with people adding a few details here and there that they thought plausible. If you can fault most of the people who have written about this with anything, it is not sufficiently testing the idea before promoting it. Articles about potato towers fall into four categories: those that promote the idea and never report on results, those that later report pretty normal potato yield, those that later report failure, and those that promote the idea and then unconvincingly report success (usually in support of selling a tower kit). An hour of research on the Internet provided a ratio of these types of articles of 74 : 11 : 9 : 2. The tower story has gotten a lot more refined over the years. It now includes details like the need to add levels at a certain rate in order to force the plant to form more stolons and a requirement for indeterminate varieties in order to produce multiple levels of tubers. These enhancements sound good. They also might convince you that, if your tower didn’t really work, it is because you didn’t do it right. We could spend a lot more time looking into the origins of the potato tower, but let’s cut to the chase. Potato towers don’t work any better than growing in containers or growing in the ground, all else being equal. All else being equal means that they get the same kind of soil fertility, the same soil temperature, the same amount of water and drainage, the same amount of soil coverage, and the same level of defense against pests. Often, it is easier to achieve these things in a container, although sometimes the opposite is true. Tuber production is limited by foliage area. Almost no potatoes produce additional stolons past the first few nodes above the seed piece. We could kill this idea entirely, based only on the relationship between foliage area and the total energy budget of the plant. The main function of a plant’s foliage is to collect energy. That energy is converted to sugars and moved into the body of the plant for storage. This is where tubers come from. They are little balls of captured energy and water. Evolution does not allow for slackers. Plants have evolved to fully use the capacity of their leaves to capture and store energy. There is no excess energy for the plant to use to form more tubers, no matter how many stolons that you might convince it to produce. If you somehow forced the plant to produce ten levels of stolons, then you would get 10 times as many tubers that would be 1/10th as large (actually less, because so much energy would have to be expended on the formation and maintenance of all those stolons). If you want more yield, you need more foliage. Nobody claims that towers produce more foliage though. The other problem is that potatoes simply don’t produce an endless number of stolons. Stolons are formed from the first few nodes above the seed piece and rarely any higher. Hilling up in excess of six inches is a waste of time and effort and only makes the plant work harder. The reason for hilling is not to make the plants form more tubers but to ensure that the tubers are covered by soil. Tubers need to be covered to protect them from pests, diseases, and sunlight, which will turn them green and increase the content of toxic glycoalkaloids. Plants will often survive extreme hilling, but you aren’t doing them any favors; they have to pump photosynthate and water farther, which costs the plant energy. The greater depth of soil can also be a barrier to water reaching the roots. It is possible that these problems could be overcome through breeding. Some wild potatoes set stolons over a larger number of nodes and also can form very long and sometimes branching stolons. These might be convinced to grow through a larger vertical space. Potato plants also vary considerably in size and a much larger plant would be able to collect more energy. In combination, these traits might make for a potato that would behave more in line with the tower potatoes that have been imagined. Even if it is possible though, it doesn’t seem like a very practical investment. The great thing about potatoes is that they are simple to grow. And cheap too. Why make it complicated and expensive? A simple container or raised bed, filled with quality soil, amended and watered appropriately, can deliver heavy yields of potato along with the other benefits attributed to towers such as easier management and harvest. Potato towers don’t work. They never did and they probably never will. No doubt, the idea will persist on the Internet as long as people still grow potatoes, which will probably be a very long time. Have you tried a potato tower? If so, leave a comment and let the world know how it worked for you. The Low Technology Institute is studying several different potato growing methods this year, including towers. If you are interested in this subject, you might want to follow along. Nathan Pierce, an admin with the Kenosha Potato Project experimented with towers for several years and documented the process at Tomatoville with lots of pictures. I think its also worth mentioning how much hotter and drier the soil is going to be in a tower vs in ground, and how much potatoes hate to have their root systems at high temps. Thanks Tim. That’s very helpful information. I will likely revise this article at some point and knowing more of the historical details will make it easier to track down the origin. The topic of growing potatoes in containers is pretty complicated, which is why I didn’t go into detail. Because they so dramatically change soil temperature and moisture levels, considerations for container growing are tightly coupled to climate. The problems that I have with growing potatoes in containers are likely to be very different than those that you experience. THEREFORE any container taller than 16″ is a complete waste of time. I’m glad that the Kenosha Potato Project is linked from your name Curzio. People who are interested in towers should really check out the KPP, because growing in bags offers a lot of the same benefits but without the hyperbole. I have tried to grow potatoes in a tower three times. Only the last time did I achieve any sense of success but it simply reflected what you stated in your article. One layer of potatoes and a meager harvest. I also attempted to grow them in the ground to no better success. Fortunately, I am better at growing other crops and will stick to them in the future. I fo, however, have a question. Sweet potatoes are grown from rooted sprouts as opposed to planted eyes. Do they grow the same way? Sweet potatoes don’t really grow in this climate, so I am not an expert on the subject. We’ve had a discussion about this in the Cultivariable Facebook group and it sounds like the same basic ideas apply. Sweet potatoes can have longer vines and more foliage area, but if you don’t let it spread out to catch sunlight or trellis it in some way, you won’t get the benefits. I had been interested in the towers, to cope with limited garden space but also to avoid a lot of fruitless digging for that last potato. Some experiments on Youtube bear out what you say; they get a layer of spuds at the bottom, a lot of empty soil in the middle and then foliage out the top. As a modified container, this year I am going to try rolling a piece of linoleum into a ‘tower’ and plant in the middle of that (without needless vertical addition), just to make harvesting easier on my back. I’ll do a side-by-side comparison with traditional in-ground planting. By the way, I had also learned to do potatoes on the surface, under a thick layer of straw (what the French here call ‘paillage’) but the crop was terrible compared to my standard beds in the same soil and same weather. And I visited a nearby permaculture project with the same experience, so ‘innovation’ is not always helpful. Straw can work, but it is very dependent on environment. Conditions can’t be too wet nor too dry and if you have rodents, they can become a big problem. My experiments with growing under straw have produced more voles than tubers. Yes, both rodents and excessive moisture probably played a part in my poor harvest from the mulching bed. Thank you so much for good informations and experiences on potato tower. I like intorduce to students and hobby gardener. I can attest to everything (first hand) you have explained and described in your article. I too fell into the “tater-tower trap” that is so pushed all over the internet. I had been using these 36″ tall towers for the last five years and generally speaking would only average fifteen pounds per container. The tubers only grew in one layer of soil as you described and adding soil would generally hinder the growth of vegetation. In addition, adding more tubers in subsequent layers of soil (filling the tower) rarely grew more potatoes by the time they were ready for harvest.This practice also required a lot of watering to reach the lowest level of tubers and a large amount of soil handling. Growing potatoes in the traditional method (in the ground) resulted, at least in my case, in higher yields that the towers did. My goal in using the towers is to grow more vertically due to my limited garden space. Thanks to reading and learning from your enlightening research, I have since cut my towers in half (now 18″ tall) and just planted my potatoes a few weeks ago…anxious to see the difference this year. What I feel is most beneficial, is the fact that you are willing to share your knowledge and expertise as you have with others! Thank you very much!! Reporting back regarding my previous post dated April 29, 2018…..
My last entry stated that I had cut my 36″ towers in half (now 18″), due to the fact that the (Internet promoted) “tower” method did not work. So now I have doubled my containers from two to four, and considering the tubers only grew approx within ten inches of soil, in reality I had doubled my growing capacity. After a full (2018) summer growing season to now be able to make a comparison, I can say my yield not only doubled, but tripled when you consider the volume of unused soil I was filling these towers with. My containers are approx 48″ in diameter and each one had a yield of nearly 20-lbs. All four of these “half towers” were planted with assorted varieties of fingerling potatoes. I keep these containers up in my garden throughout the winter, augment the soil with organic matter, and they’re ready to go in the Spring. If I hadn’t found the Cultivariable site I’d probably still be trying to figure out what I was doing wrong!!! Thank you your two very detailed comments. My last veggie garden was back around 2000. I’ve been slowly searching online to brush up my knowledge to start a raised veggie garden next Spring. I was set to build a potato tower until finding this article. Your specific comments were very helpful. Congratulations on your higher potato yields. Cheers! Rio, glad you found it helpful…happy to share my experience and all the best with your garden!!! Hi Curzio, I experimented the potato tower two years ago, expecting a total failiure. Surprisingly it worked ! I did not obtain the 100 lbs promised but let’s say a fair 22.5 lbs from 5 small potato planted. What amazed me was that I got potatoes from bottom to top, at 44 inches from the ground !The biggest of them were situated near the surface and were even turning green due to sun exposure. Many tubers were attached directly on the stem, especially those near the top. The variety used was Kennebec. So, yes some varieties do produce tubers quite high on the stem if they are burried. You can see the results on my blog. The blog is written in french but you can look at the pictures. As noted in the article, you can grow perfectly good potatoes in a tower, you just can’t expect to grow more than you would in the ground if the soil were of the same quality. 22.5 pounds from 5 plants is 4.5 pounds per plant, which is a good yield, but one that is fairly easy to achieve in good garden soil with sufficient fertility. As a rookie, last summer I was excited with the idea of making a miracle harvest with a potatoes tower. I therefore went on and tried to build one. I ends up with 3 to 4 feets of filling. I dreamed all the time that my tower is filling up with potatoes. Just to be horribly desapointed. After I tipped over the tower, I had only long stems, a handle full of potatoes at the seed level. Nothing else, no miracle. I even noticed that the seed level was relatively dry, this as a result negatively impact my yield. I hope did my home work before trying, I but I learned the hard way, potatoes tower does work. I am however wondering whether planting seed at different levels of the tower would make sens. I wish I red this article before hand. I did some research into the towers over the year and I think I figured out a way that I could force them to work, but I have to test this out this year. First, as you probably know, potatoes form on “runners” that are put out during the third phase of growth (same time as the flowers). Therefore, any filling of a potato tower after flowering will never result in deeper layers of potatoes — the plants don’t produce tubers on stems after the flowers are seen. Therefore, if one uses a tower and really aggressively fills it up so the plant has, say, two feet of fill before it is allowed to grow tall and flower, perhaps — PERHAPS — the stem could produce tubers up that entire length. I’ll try this this year, but it seems like a really persnickety way to grow them.